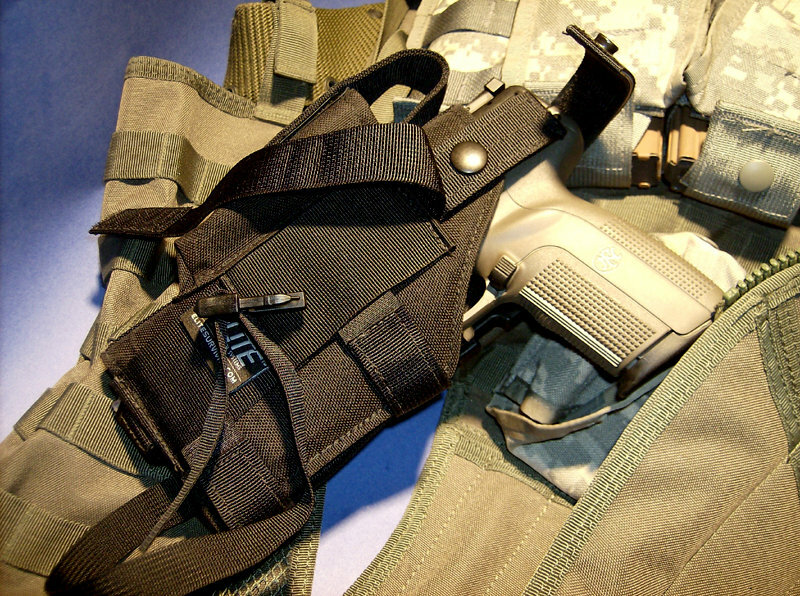 Elite Survival Systems tactical belt holster was designed to fit standard FsN pistols with a light attached. The barrel end is open for threaded barrels and suppressors. This versatile gun holster for belts was designed with adjustment points which allow the gun to fit with or without the light attached. This Elite tactical belt holster is constructed of 1000 denier nylon inside and out and has an internal stiffener which holds the holster's shape. The weapon is secured with an adjustable thumb-break retention strap and velcro over-strap for added security. It also has a spare magazine pouch with adjustable lid for secure fit. This gun holster for belts is available in two sizes and fits most full size pistols with light attached. It has two belt slots to fit belts up to 1.75" or up to 2.25" wide. The Elite tactical belt holster is also available in a modular version y) and fits most MOLLE vests and packs. As with all Elite products, attention to detail and quality of materials make the 7680 an ideal solution.